"The Logitech SLIM FOLIO PRO is an all-in-one backlit keyboard case for the 11-inch and 12.9-inch iPad Pro​​ (3rd generation). Leveraging 20+ years of keyboard innovation experience, Logitech brings a comfortable, laptop-like typing experience to the new iPad Pros complete with a dedicated row of iOS​ shortcut keys to help optimize your workflow. 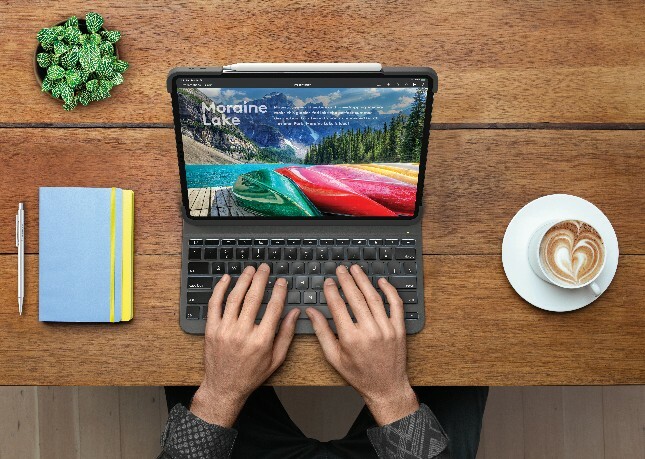 Whether you’re typing,sketching or reading, SLIM FOLIO PRO is the perfect tool to use in your living room, at a neighborhood cafe, airport lounge or even your lap," says Logitech. The company further says, "SLIM FOLIO PRO securely holds iPad Pro in a lightweight case that keeps corners protected and doesn’t weigh you down, keeping your iPad safe from scuffs, scratches and spills. 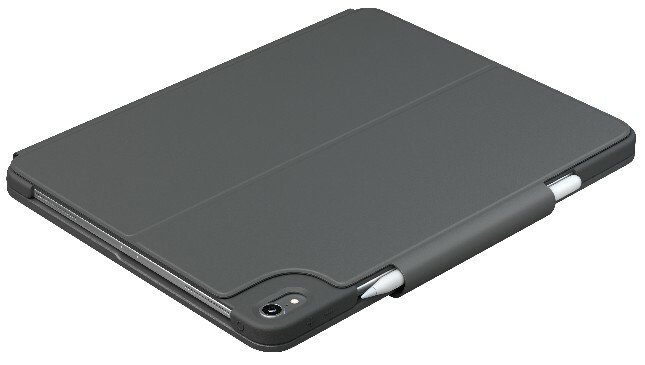 A secure magnetic latch keeps the case securely closed when not in use to protect your iPad screen. 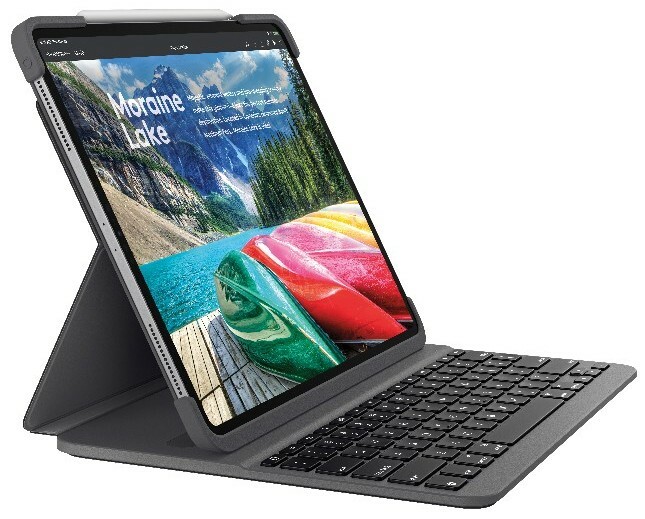 With Bluetooth LE pairing, setup is simple and the case maintains a reliable wireless connection between iPad Pro and keyboard. Once connected, your keyboard automatically remembers your device every time you open your iPad Pro to type. The rechargeable battery lasts up to three months on a single charge." Logitech shares the following dimensions. Michele Hermann, vice president of mobility at Logitech offers the following statement. The SLIM FOLIO PRO for third generation Apple iPad Pro has some really cool features, such as the ability to adjust the keyboard backlighting -- a feature not found on all such products. I also love that there is a dedicated holder for the second generation Apple Pencil, which causes the stylus to charge when the clasp is closed. Best of all, Logitech promises a superior typing experience thanks to each key's scissor mechanism. It looks like it could be a better choice than Apple's own pricier Smart Keyboard Folio. 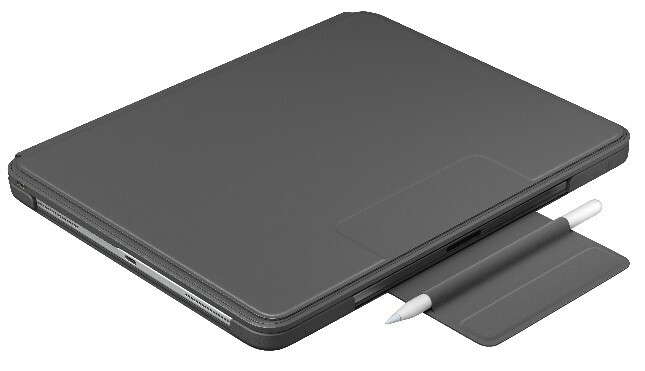 So, how much will SLIM FOLIO PRO for third generation Apple iPad Pro cost? It's actually pretty reasonable. The 11-inch keyboard case is $119.99, while the larger 12.9-inch case is just $10 more. Both can be had later this month from Logitech directly or from the usual retailers such as Amazon.